Chris Davage, our Founder and Chairman, died suddenly and unexpectedly on October 14th 2016, his funeral and celebration of his life was held on Monday 14th November 2016. Chris was an exceptional individual with drive, determination and humour. His was the vision that made our Shed as it is, centred on the notion of it being a place where members could share and develop skills, with companionship and mutual support in a community centred setting. His was the drive that masterminded operations, researched materials and exploited his innumerable contacts, convincing organisations, companies and individuals to share his vision. He also had innumerable skills which he readily shared with others. He also had the support of his wife Lynne, who willingly supported the hours out of the house and on the computer in the evenings. Chris made sure that our Shed, unlike many others, is open all day every day, so that members may come and go as they wish, undertake a task or just come and have a chat over a 'brew'. All this is why he was nominated for, and received at a ceremony in the Great Hall Winchester, the Hampshire County Council 'Good Neighbour Award'. 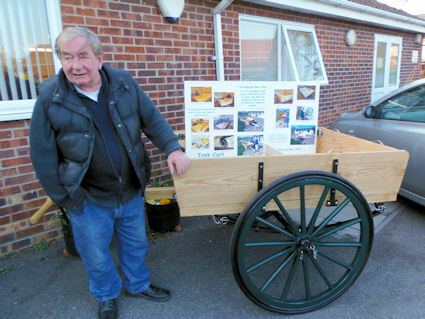 "Chris Davage founded the Waterlooville Men's Shed which has provided the opportunity for over 30 older men, sometimes isolated and lonely, to share and develop skills, provide companionship and undertake projects for themselves and the community." Due to his effort and hard work we have a Men's Shed to be proud of, well established, with a clear sense of purpose and a friendly, welcoming attitude. Chris Davage will be impossible to replace. A unique, talented and skilled Chair. We are determined to continue his work, and thank him for all that he did for members past, current and future.